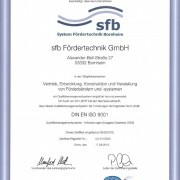 sfb Fördertechnik GmbH – Your specialist for material flow and intralogistics. 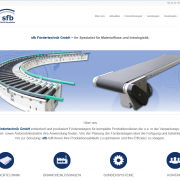 sfb Fördertechnik GmbH designs, manufactures and implements conveyor systems for production lines in the packing, pharmaceutical, food and automotive industry. From draft to production, installation and even training: sfb helps you to optimize your production flow and raise your efficiency. Belt conveyors, roller conveyors, chain conveyors, link chain conveyors, rotary tables, buffer tables, accessories, … – an overview of our products. Our conveying systems are widely used in diversified areas and industry sectors. Check our industry solutions! Planning, design, manufacturing and assembly are customized to your special requirements. Conveying solutions for your application. 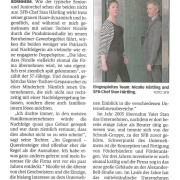 https://sfb-foerdertechnik.de/wp-content/uploads/2015/10/sfb-Foerdertechnik_Webpage2.png 914 1169 Nicolle Kaus https://sfb-foerdertechnik.de/wp-content/uploads/2015/07/sfb_logo1.jpg Nicolle Kaus2016-03-21 08:00:222016-03-21 08:47:41New website!